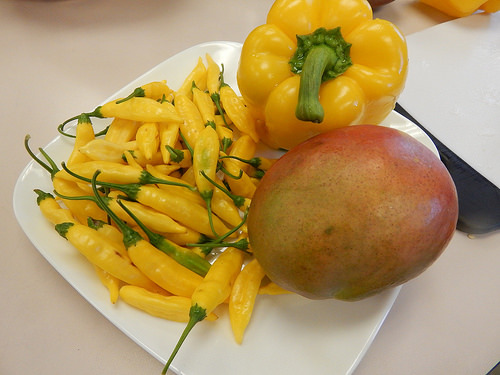 I finally had time to try a few recipes using some of our less common peppers in the Demo Garden. I still have a few other recipes I want to try as well. I may have to plant hot paprika peppers myself, just so I can make this recipe every week. 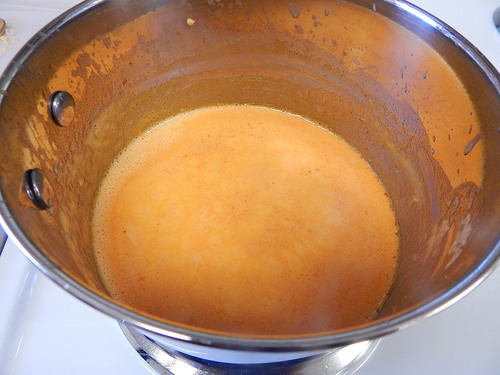 I adapted a straight red pepper cream sauce to the paprika sauce. A lot of sauces call for powdered paprika, but I wanted to try using the peppers fresh. I ended up using one red bell pepper, two white sweet paprika peppers (Feher Ozon), and two red hot paprikas (Leutschauer). Then I took a stick blender and blended it until smooth. Then I added a little salt and pepper. I served it with pasta and chicken. The hot paprikas added just the right hint of flavor and spiciness. 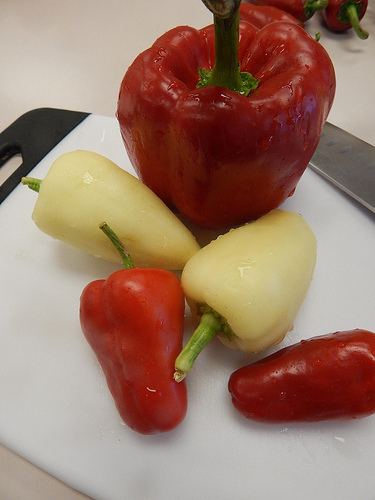 I also tried this recipe at home with plain colored, sweet peppers. It was also tasty, but not with the same depth of flavor. This recipe called for 8 oz. of the fresh Aji Limon peppers, 8 oz. 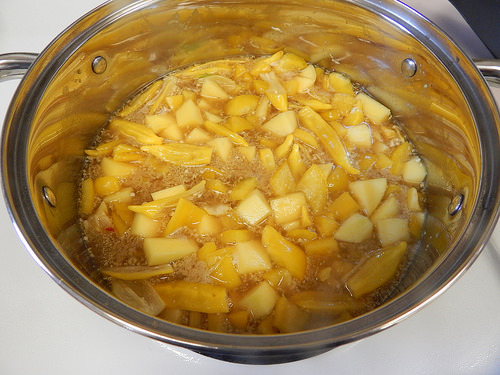 of yellow bell pepper, 2 mangoes, brown sugar, and a bunch of vinegar and lime juice. I’ll be honest…I was afraid of how hot it might be. The recipe didn’t say, so I decided to seed all the peppers. I chopped everything up, mixed it together, and tossed it into a saucepan. I let it cook until everything seemed soft and blendable. At that point, I brought back the stick blender to smooth out the lumps. After tasting, I would characterize this as a “hot” salsa. In other words, comparable to the heat level you might find if you buy a salsa labeled “hot.” If you regularly eat or enjoy spicy foods, this will be a nice salsa for you. If you are not into spicy foods, you will probably want to steer clear. 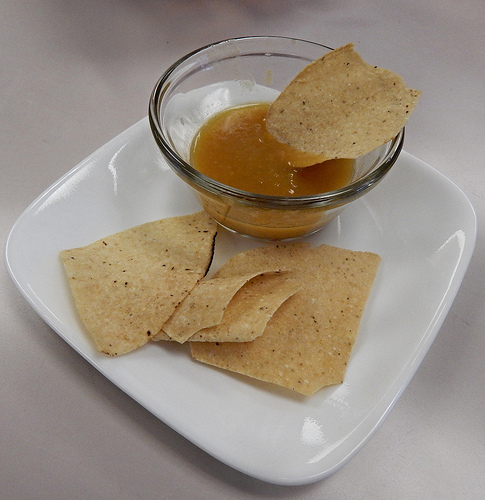 That said, as with any salsa that contains a lot of brown sugar and mango, it is very tasty. 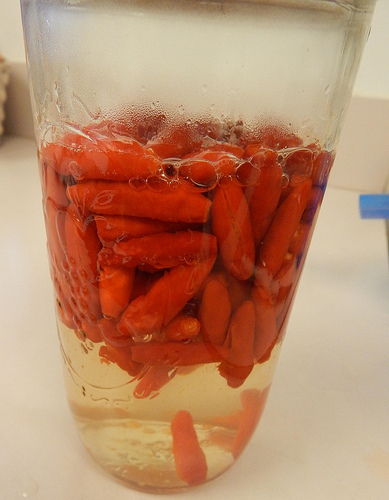 To use some of the Tabasco peppers, I was tempted to try making homemade tabasco sauce, but I decided to be kinder than that to my office mates. I settled for making a southern-style vinegar sauce. I started with the Tabasco peppers. The fully ripe ones popped off the plant without the stems, which was handy. I washed them, and then slit them along the side. 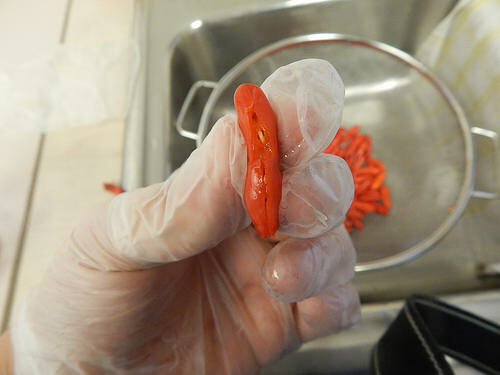 ﻿ When working with hot peppers, I strongly recommend wearing gloves! As much of a pain as it is, it isn’t as painful as getting capsaicin everywhere I don’t want it. Then all I did was heat a cup and a half of white wine vinegar and pour it over the peppers in a jar. You could add garlic or peppercorns, but I decided to stay simple. I’ll give it a couple weeks to “steep” before trying the flavored vinegar. 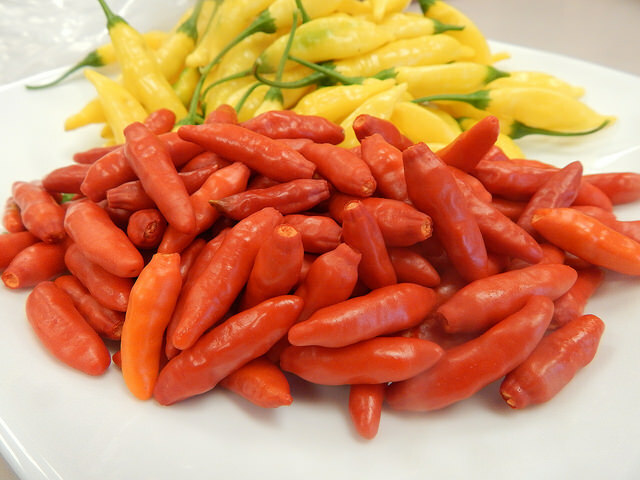 Still to come in another post: the Espelette peppers, the Fushimi peppers, and dehydrating peppers. Posted on October 25, 2016, in Harvesting & Eating and tagged peppers. Bookmark the permalink. Leave a comment.